I took my daughter to the mall on this past weekend. She asked if one of her friends could tag along and of course I agreed. While my daughter is shopping for her remaining needs for school her friend begins to look at some items also. I was minding my business when this little lady came up to me with a pair of jeans and a t-shirt in hand, “Mrs. Pinckney, will you get these for me?” I stood shocked at first but then encouraged by her boldness. It was in that moment I realized I often fail to ask when I am in need. I go about trying to figure out how I will work it all out myself rather than just asking my Father. Our reference scripture assures us that we can ask in confidence, believing we will receive what we ask according to His will. I was reminded of this simple truth by the boldness of a teenager. How much more do we need this same boldness when we approach our Heavenly Father?! I would like to encourage the hearts of those that still doubt today. You don’t have to be afraid to ask God for what you need. He is a good Father. If you ask Him, He is willing and able to give you good things. Take a look at this scripture reference in Matthew 7:9-11 If a child asks his father for a loaf of bread, will he be given a stone instead? 10 If he asks for fish, will he be given a poisonous snake? Of course not! 11 And if you hard-hearted, sinful men know how to give good gifts to your children, won’t your Father in heaven even more certainly give good gifts to those who ask him for them? 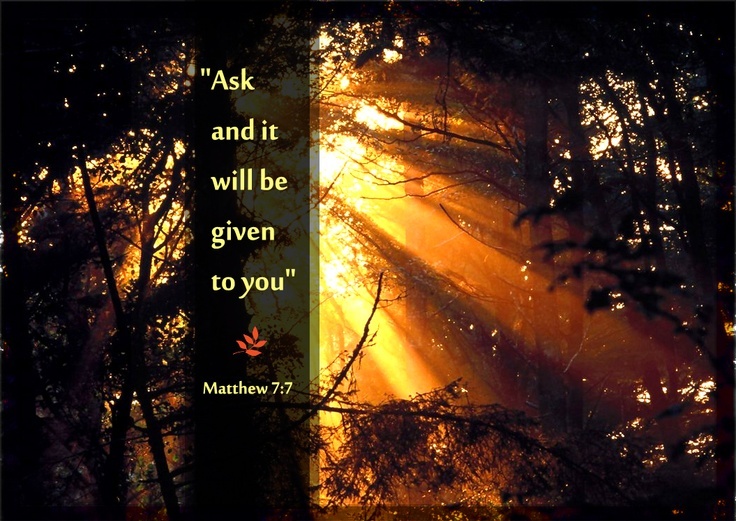 Go ahead, ask and when you do, ask believing.